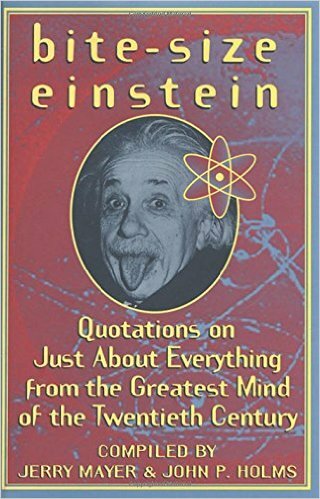 This is an interesting book of which Einstein expresses his thoughts on various topics. 1.True art is characterized by an irresistible urge in the creative artist. I can feel this urge in Ernst Bloch’s work as in few later musicians. 2. One flower is beautiful, a surfeit of flowers is vulgar. 3. Music does not influence research work, but both are nourished by the same source of longing, and they complement one another in the release they offer. The foundation of all human values is morality. To have recognized this is the unique greatness of our Moses. In contrast, look at the people today! Nothing truly valuable arises from ambition or from a mere sense of duty ; it stems rather from love and devotion towards men and towards objective things. Nothing will benefit human health and increases the chances of survival of life on Earth as much as the evolution to a vegetarian diet. 1. With fame, I became more and more stupid, which, of course, is a very common phenomenon. There is far too great a disproportion between what one is and what others think one is, or at least what they say they think one is. But one has to take it all with good humor. 2. Yesterday idolized, today hated and spit upon, tomorrow forgotten, and the day after tomorrow promoted to Sainthood. The only salvation is a sense of humor, and we will keep that as long as we draw breath. Make friends with a few animals. Then you will become a cheerful man once more and nothing will be able to trouble you. People are like the ocean; sometimes smooth and friendly, at others stormy and full of malice. The important thing to remember is that they too are mostly made of water. 1. The most beautiful thing we can experience is the mysterious. It is the source of all true art and science. 2. Imagination is more important than knowledge. Knowledge is limited. Imagination encircles the world. 3. Great spirits have often encountered violent opposition from mediocre minds.